We are beyond excited to announce that we are adding another veterinarian to the Town N Country family! 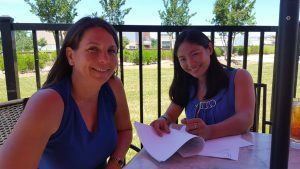 Dr. Megan Hirano will be joining our staff on June 30, and we can’t wait for you to meet her. 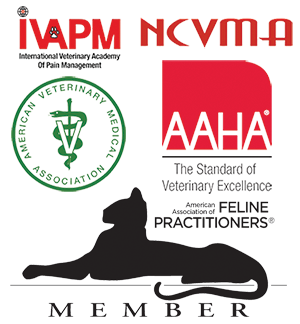 Our practice is growing, and we needed another veterinarian to be able to continue to give you the individual attention and the high quality medical care that we are committed to providing. 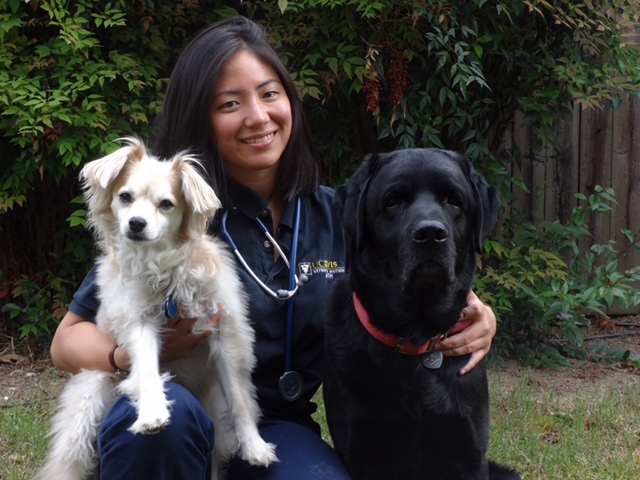 A native of Sacramento, California, Dr. Hirano attended veterinary school at UC Davis. After she graduated, she moved to North Carolina and began working at a mixed animal practice in Lumberton. 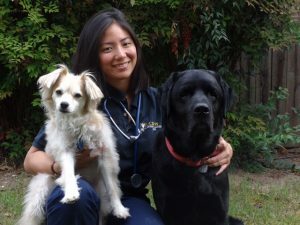 She loves preventative medicine and internal medicine, and especially enjoys working with exotic small animals. Dr. Hirano’s significant other Wei-Chun is a cognitive neuroscientist at Duke University. The couple has three rescue dogs. Whiskey and Brandi are chow mixes and are one year old and ten months old, respectively. Sophie is a two year old hound/pointer mix. The dogs love hiking – especially at the Eno River – so don’t be surprised if you run into them there, with their mom and dad in tow! They also recently adopted a two year old paint horse, Steve ‘Captain America’ Rogers, who was found tied to a tree by animal control. He’s a very sweet and gentle gelding who is learning quickly under saddle. Speaking of horses, Dr. Hirano is quite the horsewoman. She has been riding horses and competing in show jumping since she was six years old. Since this is North Carolina, we have to tell you that Dr. Hirano’s sports loyalties span the continent: she loves the UNC Tar Heels, the Carolina Panthers, the Giants, and the Golden State Warriors. 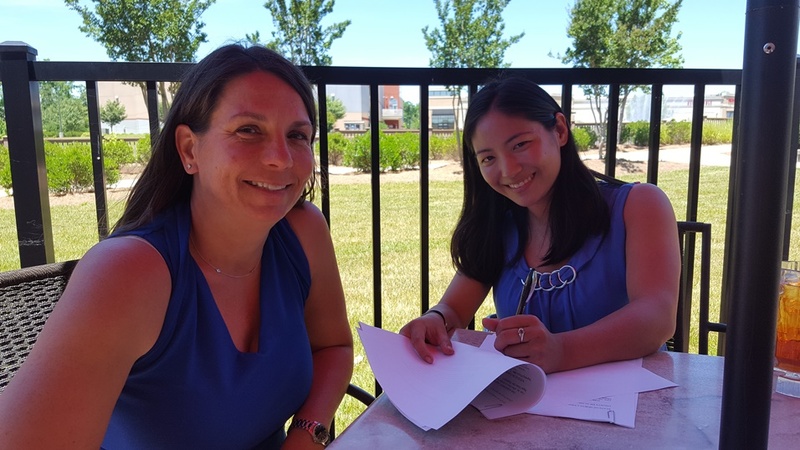 Dr. Hirano is going to be a fabulous addition to our team. She has excellent medical skills and a friendly and understanding bedside manner. She focuses on treating the whole patient, and not just an illness. She’s got a laid back, positive personality, and we know you and your pets are going to love her! Does the sound of your car’s wheels drive your pet crazy? Carsickness is a world of trouble for many dogs, cats, their owners – and their vehicles. A car ride that runs too long can confuse a delicate sense of balance, upset young tummies and set up a pattern of negative association and sickness. Puppies and younger dogs are especially prone to carsickness due to the fact that their ears are not yet fully developed. 1. Take it easy. A short ride gently introduces your pet to the open road. When the car goes to fun destinations like a dog park more often that it goes to the vet’s office, your pet’s a happy traveler. 3. Facin’ your pet forward. You can position the kennel accordingly, and rest assured that should she become ill, the clean-up chore will be simpler. Or you can use a seat belt specially designed to keep your dog facing forward. If you allow your dog to sit in the front, remember that an air bag presents the same dangers for your pet that it does for a small child. 4. Rollin’ down the windows. Not only does fresh air feel great blowing in your pet’s fur, his ears will appreciate the difference in air pressure. 6. Just standin’ on the corner. If your furry friend only associates a car with sickness, you can help establish new thought patterns. Start small – let him sit in your back seat a short while with the doors open. In another week, you two can take a ride around the block and eventually you can travel to a nearby park or other happy place. Laozi was right: the journey of a thousand miles starts with a single step. 7. Gettin’ help from a friend of mine. If your best efforts still leave you cleaning up your car, talk to us about a prescription medication to help your pet. Cerenia® is an option for those with motion sickness. AdaptilTM works well for many of our patients. Fortiflora®, is a pro-biotic that can prevent travel induced stress colitis. AND if your pet doesn’t even try to understand. Remember, your dog or cat’s idea of taking it easy may not involve the open road at all. Talk to us about boarding your pet with us for your next vacation. You can enjoy your trip, and our staff members will be happy to spend some quality time with your pet. So whether you’re going to Winslow, Arizona, or just heading over to see us, we hope these sweet tips will save you – not to mention the upholstery on your flat bed Ford! 2. Royal Throne. Your pet’s crate provides him with a safe, familiar environment for travel. Consider it her throne away from home. 3. Royal Scepter. Don’t forget your pet’s favorite things! A leash, special food, daily meds, and a favorite toy can help your pet handle the differences that travel brings whether by plane or by car. Taking a small pet first aid kit is also a good idea. 4. Royal Jitters. Adaptil®, available at Town N Country, is an anti-anxiety aid for nervous, furry travelers. Adaptil® collars and diffusers encourage diffusion of pheromones, hormones released by lactating mammals to comfort and soothe. 5. Royally Lost. Getting lost happens to the best of us. Should your dog or cat wander, a microchip can help ensure a safe return. If your pet isn’t chipped, give Town N Country a call. 6. Fleur Royale. Sensitive stomachs sometimes need a little extra kindness on the road. Some dogs develop stress colitis, which is an inflammation of the colon that usually means diarrhea. Ask us about Fortiflora®, a pro-biotic that can prevent travel induced stress colitis. 7. Royal Meals. Give your pet a light meal three to four hours prior to your departure. Never feed your pet in a moving vehicle, and once you’re there, be careful that no one else slips in rich foods that aren’t healthy. 8. Proof of Royalty. Bring along a copy of your pet’s vaccination records. While you hope to never need them, it’s better to be safe than sorry. 9. Ruling from Afar. If you’ve weighed all the options, and decide that it would be better to leave your pets with us, let your pet rule the roost and stay in Kitty Corral and Doggy Day-Care. Call us for an appointment. Whether you’re traveling with or without your pet, give us a call to be sure your pet’s vaccinations are up to date and ready for travel. 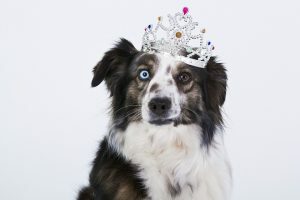 You don’t want anything to get in the way of a royally good time for you and for your pets. Happy Summer to you and your pets. And long may they reign!